Hard drive storage is still a mainstay in the business world today. Even with the ever-increasing presence and viability of cloud storage, virtually every office has dozens of hard drives that store critical business information. 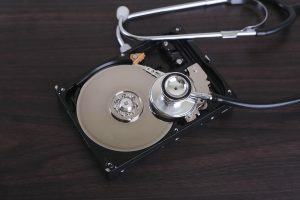 Understanding when a hard drive is about to fail and making sure that your IT department is conducting regular maintenance should be a huge part of your data management plan. Critical business files should be backed up regularly, but if they aren’t and a it fails, there’s a chance that the information can’t be recovered- and if it can, it’s not cheap. Use these articles to learn more about hard drives- warning signs that they’re about to fail; how to maintain them; and more about the history of hard drives, and how they’re used to store different types of data. We offer tips on how to keep your hard drive healthy- and warning signs if it’s about to overheat or die. The more information you have about a healthy drive, the more likely you are to have a long-lasting drive. Learn more about how to add or change out a drive, and some frequently asked questions about hard drive maintenance. We have gathered information on the evolution of the drive, and how to optimize your internal and external hard drive space. Do You Need Hard Drive Recovery Services? Record Nations Can Help! Record Nations has a network of hard drive recovery experts use the most reliable, state-of-the-art techniques to recover your data and get your business back on it’s feet as quickly as possible. If you know you’re hard drive is completely dead, take a minute to fill out the form to the right. If you’re not 100% sure, we put together some resources to help you determine if you need hard drive recovery services, or if you’re lucky enough to just have had a scare. Check out the warning signs that your hard drive is about to die. Learn more about the costs of recovering data from your hard drive. Take these steps to ensure that your hard drive isn’t overheating.